I would like to thank you for your title and the contradictory Disclaimer. Anti-PO people google PO debunked, get your website and without thinking they use it as evidence against PO. By doing this they immediatelly show their ignorance and not to mention prove that peakoil is real, according to you. it seems to me that the primary reason for the phenomenon you're describing in this post is that small collections of fields decline in production, in part, because cheaper oil is discovered elsewhere. When you look at the planet as a whole, it is clear no cheaper oil will be discovered, so we shouldn't necessarily expect the same pattern to play out. Excellent look at a small part of the complexity of oil supplies, pricing, and production. The high price of oil (anything over US $70/barrel) brings more oil into play that otherwise would be considered "past peak." The term "plateau" is far more accurately descriptive of what production is likely to be like for the next few decades. At times diminishing, at times increasing--production will not follow the script of peakers. Production will certainly crash, when the price that consumers will pay for oil drops. That will be when they no longer need it. No one knows when that will be, but I suspect it will happen between 15 and 20 years from next Tuesday. The incredible simple-mindedness of those who believe "peak oil" involves a sharp peak followed by ever-diminishing production is difficult to describe. Perhaps being forced to wipe the drool off their chins would serve better than words. PO is just another Global Warming, acid rain power play. In twenty five years it won't matter anyway. The United States will be overrun by 70 to 100 million Mexicans. On average the US IQ already dropping in the face of rising superstition and junk science will be roughly 85. We will become more third world soaking up the stupidest people on the planet. I call this the peak IQ theory. Thus even if we have a small number of smart people that could solve many technological problems, we will have an electorate with their hands out looking for more welfare and benefits so they don't have to work or think. We already have peak marriage, and peak children with birth certificates so clearly we have a good start to arriving at peak income. I think I can safely say the America you see today will be one large Mexico City tomorrow. When that happens who will give a freaking crap about Peak Oil? Ah, yes. Nevermind about running out of energy or increasing runaway global temperatures. The brown people are coming! The brown people are coming! Lord Robot:Thus even if we have a small number of smart people that could solve many technological problems, we will have an electorate with their hands out looking for more welfare and benefits so they don't have to work or think. Oh, yeah, except that, Jobless rate higher for U.S.-born than immigrants. But, never mind. As long as we can keep the brown people out, everything will be okay. Bravo JD, you've countered a faulty analogy with ... a faulty analogy. If production fell and comsumption fell that is a totally different scenario then if production falls and consumption rises. A better analogy all around might be "what happens when a person's food intake declines?" And the answer should be, "That depends." We all know Americans eat too much (use too much oil). So this wouldn't cause starvation (TEOTWASKI). What if Japan's "calories" were restricted by 10%? Africa's? What if America had 5% fewer calories every year? rather than "it is clear no cheaper oil will be discovered", it is in fact clear that, if 'cheap' = cheaper to produce, we do not/cannot know this with such certainty. within the current futures determined oil price regime, price can collapse for reasons other than physical production/consumption relations. I've never been able to understand why most peak and not-peak adherents fail to understand this unless they've never bothered to study the actual mechanisms of price formation which have developed since 1987, as well as those which were superceded. 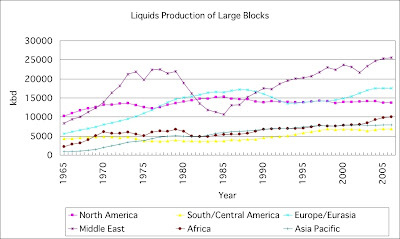 BTW Folks, if any of you took the time to study the full history of the post-1960 origins and development 'peak oil', well, they might come as a surprise. Hint, think 'social-industrial complex'. "Oh, yeah, except that, Jobless rate higher for U.S.-born than immigrants." Umm, these stats are from 2006 and obviously don't apply in the current economy. These stats have got to be suspect anyway. How easy is it to track the employment figures for a group of people that don't "officially" live here? "But, never mind. As long as we can keep the brown people out, everything will be okay." Perhaps won't make everything okay, but at least it is one less intractable problem that we would have to deal with. The continued balkanization of the U.S. may not currently be an issue with this group. But at some point in the future, not very distant, it will be an overriding issue as the U.S. is hollowed out, becomes increasingly dangerous, and those of Northern European ancestry in desperation start to return to Europe.